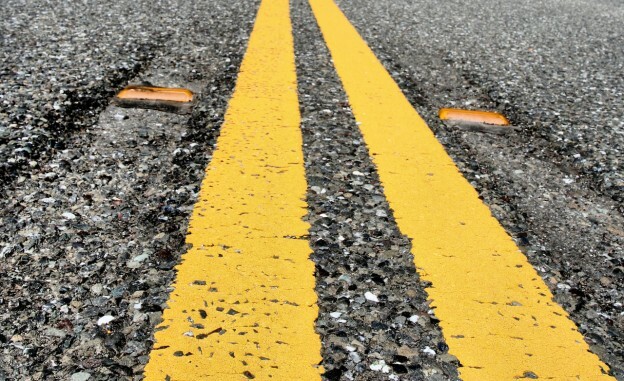 EducationShift aims to move journalism education further down the road toward change. Photo courtesy of Clearly Ambiguous on Flickr. When I do multimedia trainings for college educators with Al Tompkins of the Poynter Institute, we get to a particular point in the arc of the sessions and see a specific response. We stand before these teachers after talking about what journalism education needs and all the tools they can apply. We’ve been going and going and going and then boom — we see apprehension and information overload painted on many of their faces. They’re the deer. We’re the headlights. "EdShift is about more than talking about journalism education. It's about action." We get to this point every time, and our response is always the same: Calm down. You don’t have to do everything. But you must do something. Pick one tool, one idea, one experiment and move your classes forward. Your students deserve it, and journalism needs it. That simple concept — forward — is at the very base of today’s launch of EducationShift. Here at MediaShift, we were running and linking to lots of pieces about journalism education. Are curricula broken? Does tenure get in the way? What new tools can teachers use? All these ideas and discussion are important, but we didn’t see them advancing things in many journalism programs. 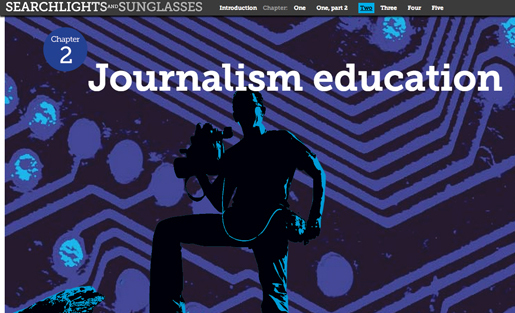 Searchlights and Sunglasses covered journalism education through an experimental digital approach, including a learning layer of resources and activities. EdShift launches today with the aim of becoming the central hub for journalism educators, students and professionals to find resources, tools and support for transforming their work. Spurred by Searchlights and Sunglasses — the experimental digital text by Eric Newton — and supported by a grant from the Knight Foundation, EdShift is about more than talking about journalism education. It’s about action. We’re buoyed by evidence that educators want this action. In our survey of educators last month, desire for opinion pieces on journalism education ranked low — the third-least attractive kind of content. But actionable content such as materials to adapt for classes or pieces on specific concepts to teach scored high, 4.50 and 4.53 on a 5-point scale, respectively. Remix. This continuing feature will cover assignments, courses and curricular approaches that are already working in a program. Authors will detail their work and provide you with links to materials, so you can adapt what they’re doing in your own school. #EdShift chats. Every first and third Friday of the month at 1 ET, we will gather digitally at #EdShift on Twitter to discuss topics that matter in journalism education. We’ve already talked about funding and entrepreneurship. This Friday, Feb. 21, we’ll tackle “Does a journalism degree matter?” Join us. Training opportunities. We’ll work to find and cover opportunities to learn new things to apply to your teaching. Efforts like the Entrepreneurship Institute at Arizona State University or Poynter’s Teachapalooza Educators Seminar can have tremendous impact. Experimental thinking. As efforts like Searchlights and Sunglasses unfold, we will look at them as exemplars and offer ways to incorporate them into your own efforts. And we’ll point you toward funding opportunities to help realize some dreams. Resources. When you need to find tools for training or coverage of helpful new releases, EdShift will be your stop. We’re going to start by unpacking NewsU’s Digital Tools Catalog and other useful efforts you might not yet know about. Perspective. EdShift isn’t just for teachers. We want to engage students and professionals, as well. Look for coverage of meaningful new work, ethical considerations and career growth. We’ll also take you to events like Journalism/interactive, the International Symposium on Online Journalism in Austin, and the Online News Association annual conference and tell you what we’ve learned. Chances are you got to this page because you’re already innovating in your classes and linked to it from social media related to that. We need to move beyond preaching to the converted. You can share EdShift in your own program and extend our reach to those who aren’t already moving forward. Email this to your faculty list. Post it to a Facebook group. Share it with your students. If you think EdShift is a positive development, help us broaden the reach. Do you have an assignment or course innovation you’d like to share with other educators in Remix? Have you cracked the curriculum code and made real advances in your school? Did you attend a killer training or get a grant to update your class? We want to hear about it. Visit our contributors form to tell us what you’d like to say to other educators. Journalism has moved from monologue to dialogue, perhaps one of the best developments from the digital disruption. We want EdShift to be the kind of conversation space where educators, students and professionals can engage and learn from each other. Post comments. Join our Twitter chats. Look for our mixers at conferences. Contact me with ideas for events that can draw us together. Disruption can be frightening, but it’s also exciting. We have more opportunities to grow and change in journalism schools than we have ever had before. Leave behind the wide eyes as the headlights of change approach. Move forward with EdShift. Kathleen Bartzen Culver is an assistant professor in the School of Journalism & Mass Communication at the University of Wisconsin-Madison, teaching and researching at the intersection of ethics and digital media practices. Culver also serves as associate director of the Center for Journalism Ethics and Education Curator for PBS MediaShift. Here at the University of Georgia we’ve been given until the end of the semester to revamp our curriculum and with an eye toward combining journalism and broadcast news into a single department. It wouldn’t go into effect until Fall 2015 given such changes have to be approved by the University and state, but we have until the end of this semester to essentially recreate both curricula — assuming we agree such a combo makes sense. Talk about an EdShift case study in the making. A lot of us don’t want to merely weld the two programs together but instead create something new. We just don’t know, yet, what that new thing would or should be. Gonna be fun. How about we set up online courses to train journalism instructors on skills and tools needed in teaching digital journalism? Knight Foundation has been offering data and social media MOOCs; in a similar vein, we can use the same platform and enlist subject matter experts to teach courses aimed at journalism instructors. Sounds like a pragmatic approach to making necessary change that can be slow and political in academia. But in our disciplines, we can’t afford to move slowly or act politically, or we face irrelevance. Excited to contribute.